Winter squash are members of the Cucurbitaceae family. Like summer squash, they too are related to the melon and the cucumber family. 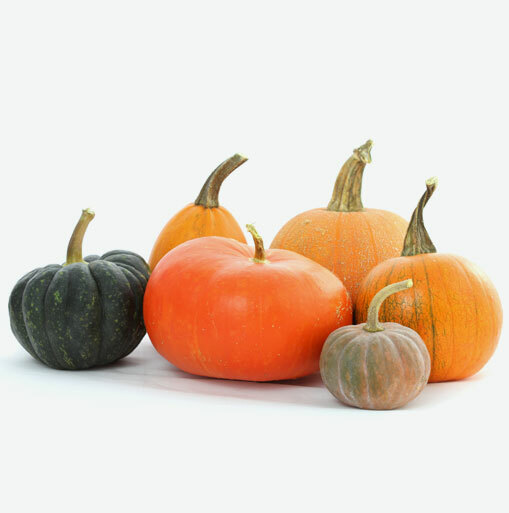 Winter squash come in many different varieties. While each type varies in shape, colour, size and flavour, they all share some common characteristics. Their shells are hard and difficult to pierce, enabling them to have long storage periods for up to six months. Butternut squash: Shaped like a large pear, this squash has a creamy, tan coloured skin and a deep orange-coloured flesh with a sweet flavour. This squash is easy to peel and cube. Great for soups or on its own as a side dish. Buttercup squash: Buttercup squash is round and almost tubby looking. It is dark green with grey flecks. It yields a golden orange flesh that is delicious and sweet. This squash makes a thick, rich puree. It can be cubed or peeled. Acorn squash: Acorn squash, also known as Pepper squash, can have green , orange or even ivory coloured skin. The flesh has a unique flavour that blends the sweet, nutty and peppery combinations well. It is not suitable for peeling or cubing. Acorn squash is best baked. Pumpkins: Pumpkins that have the most flesh and sweetest taste are the small sized one known as sugar or pie pumpkin. Of course, the pie pumpkin is the choice of squash when baking those delicious pumpkin pies. Winter squash, unlike the summer squash can be harvested very late into the fall. This squash has longer storage potential, and still provides an outstanding dose of nutrition. Winter squash delivers a great dose of Vitamin A (beta-carotene), potassium, dietary fiber and Vitamin B-6. One of the most abundant nutrients in winter squash, beta-carotene, has been shown to have very powerful antioxidant and anti-inflammatory properties. Beta-carotene is able to prevent the oxidation of cholesterol in the body. Since oxidized cholesterol is the type that builds up in blood vessel walls and contributes to the risk of heart attack and stroke, getting extra beta-carotene in the diet may help to prevent the progression of atherosclerosis. Winter squash is susceptible to rotting easily and so it’s important to carefully inspect the squash before you buy it. Choose squash that are firm, heavy for their size and have dull, not glossy, rinds. Winter squash has a much longer storage life than summer squash. Depending upon the variety, it can be kept for about one month in a cool, dry dark place.. The ideal temperature for storing winter squash is between 50-60°F (about 10-15°C). Once it is cut, cover the pieces of winter squash in plastic wrap and store them in the refrigerator, where they will keep for one or two days. The best way to freeze winter squash is to first cut it into pieces of suitable size for individual recipes. After washing winter squash, cut it in half and remove the seeds and fibrous material in the cavity. Depending upon the recipe preparation, you can either use it peeled or unpeeled. Alternatively, pierce the squash near the stem with a knife to allow any steam to escape, then bake in a 350°F oven for about 45 minutes to an hour or until a knife can be easily inserted near the stem. Top puréed cooked winter squash with cinnamon and maple syrup. Steam cubes of winter squash and then dress with olive oil, walnuts and a pinch of sea salt. Top “strings” of spaghetti squash with pasta sauce. Add cubes of winter squash to your favourite vegetable soup or stew.